It is with great pleasure that we bring you an exclusive one-on-one interview with Bassist extraordinaire David Pastorius. In this interview we will be discussing the how, where, and why of David’s bass journey, as well as amazing stories leading up to his first solo release entitled ‘Radio Gold’. ‘Radio Gold’ speaks out strongly with 14 different killer grooves that blend jazz, funk, rock and prog flawlessly into an eclectic musical collage that will undoubtedly take you on the ride that this album was built for. Pastorius also brought on board some really cool musical guests including rock guitar legend Pat Travers and David K Mathews, who tickled the ivories with Santana. Other appearances include Tom Allen, Dave Pastorius and the local 518 band members, Alex Petrosky and Al Brodeur. Also featured are Wisny Fernandez, Carl Lewis, Italian Plush, Ndgo Blaq, Vinnie Marshall, James Culliver and little old me, Momo, on one song as well. 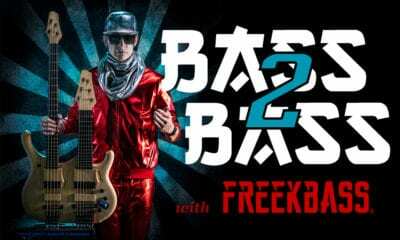 One of the things I love about this interview is how it flows and quickly answers all you would want to know about an awesome bass player and his journey, as well as tips and tricks. It’s very organic, just two guys hanging out, tripping out on bass stuff and even a few unexpected surprises along the way makes for an awesome view into the life of a really cool bass player, interviewed by another bass player. Now that’s all about Bass!! David Pastorius is a fascinating and talented musician that plays to the beat of his own Bass and I encourage you to check out and support ‘Radio Gold’. Now make sure you check out that whole interview, I assure you it will just fly by; you will be inspired! !